Combinatorics on words is an old area of research that has matured into a separate discipline in the last few decades. It studies properties of sequences of symbols, either finite or infinite, typically over affinite alphabet. The focus on words can be algebraic, combinatorial, or algorithmic. The field has many connections, not only to topics in mathematics and theoretical computer science, but also to other scientific disciplines. Such areas inside mathematics include, for example, certain parts of algebra (e.g., combinatorial group theory and semigroups), probability theory, number theory, and discrete symbolic dynamics. Areas in other sciences include, for example, crystallography, and DNA sequencing. Combinatorics on words has been particularly connected to and motivated by theoretical computer science, e.g., automata theory and pattern matching algorithms. Recent breakthroughs, however, like the resolution of the decades-old Dejean conjecture, have led to new interest and momentum in this area. 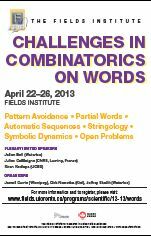 The aim of this workshop is to bring together both experts in the various flavours of combinatorics on words and young researchers to work on the outstanding problems of this field. The approximate attendance is expected to be 40 persons. This workshop will be the fourth in a series. Previous workshops were held at Oberwolfach (August 2010); Dagstuhl (February 2011); and BIRS (February 2012). 7:00 p.m. Meet infront of the Fields Institute, 222 College Street, followed by walk to a local restaurant.